Have you considered volunteering but not got round to it? 1. You will learn a lot – whether it’s about the worldwide geo-political situation (the stuff you will never read in the main stream media). You will learn things you didn’t know you needed to know, for example what a medium hoodie REALLY looks like. You will learn things that you never dreamed you would know, like how to count to ten in Eritrean. And when you have forgotten how to count to ten in Eritrean a week after you return, you will remember that Eritrean is a very very tricky language to learn. 2. You will learn a lot about yourself, including how to work with teams of people from a variety of nationalities, ages and backgrounds, sharing new experiences with them. And you will be guided in all this by the experienced and humane leaders at Care4Calais, and inspired by their commitment and kindness. 3. You will have the unforgettable experience of spending time in the treasure-trove of the Care4Calais warehouse, listening to some incredibly eclectic tunes (and even dancing to them). Lunch is always good too, especially for those seeking variations on the vegan diet aka you won’t believe it’s beans! (Spoiler – it IS beans.) You will experience many emotions as a volunteer but it will be the kind of fun that doesn’t come along every day or even many times in a life time. 4. You will meet some incredible people. The refugees I have had the privilege to spend time with have been the most incredibly positive, interesting, resilient people, facing some pretty horrific situations with humour, warmth and hope. The volunteers – both long and short term – I have met are (and I choose this term with care) beautiful people. You don’t get to meet people like that every day. It’s worth making time in your life to go and meet them. 5. You can see what it’s really like. 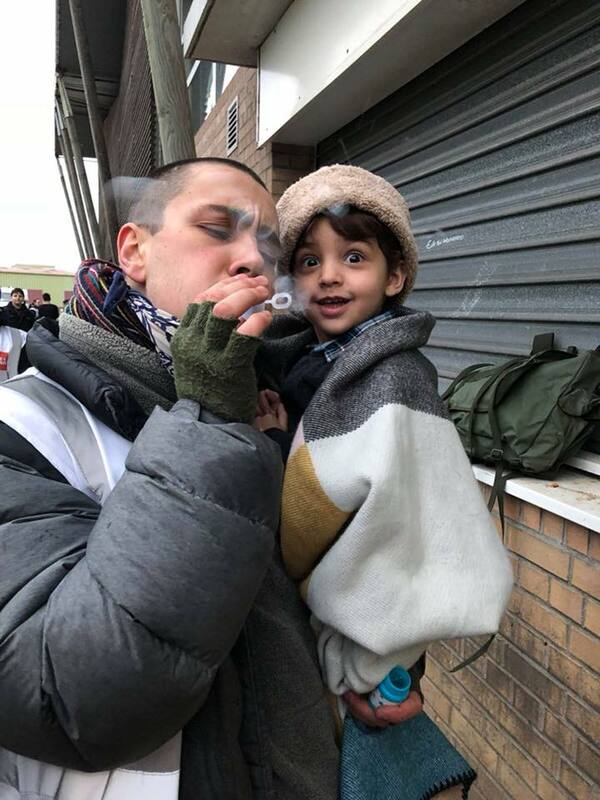 You can read other peoples’ experiences, you can even read – if you can bear it – some of the media reporting about the situation in Calais and Northern France. But unless you go, you can’t really understand it. 6. If you understand it, then you can bear witness. When you go back you can tell it how it is, not how the mainstream narrative would like it to be. You can talk about the people you met and the conditions they are living in. And when you hear an untruth or a distortion whether in the pub or on a radio phone in or in some on line comments – you can speak the truth. And you will know the truth and the truth will, as the saying goes, set you free but first it will tick you off. 7. You can do something. If, like me, you are sometimes overwhelmed by the misery and horror of the modern world, then doing something positive can really help. And there is so much you can do. And the things that you can do, are the things that you want to do and you are good at. If you are uncomfortable with speaking to people you don’t know, then you can do something else instead – you can sort shoes into sizes, or chop vegetables, or wash feet, or drive other people to places where they can do those things. And all of these things are good things and they need doing. 8. The single most important thing you can do is to just be there. To stand with the refugees and be near them in the place and the circumstances they are experiencing. And just because you don’t have the power to change those circumstances doesn’t mean that being there doesn’t have value. It matters to be there, to listen and to remember. There is strength in solidarity and in knowing that other people care and that you will stay in someone’s thoughts. Solidarity is powerful. 9. If you live in the UK, then Calais is very close and easy to get to, relatively. If you can spare the time and money to go to the European Refugee Camps, then go and bear witness there. But you can go to Calais for the weekend. You can stay in the (lovely, clean, cheap, ethical) hostel on the sea front. You can even try out one of the bars and pubs in the evenings if you need to unwind. And you might well need to unwind. 10. I believe that there will be a time in the future when we will have to account for our actions during this refugee crisis, whether it is to our children or grandchildren or more generally to the generations that come after us. About what you did to help and what you thought about what was happening during these difficult years of the 21st century. I wonder, what will you say?